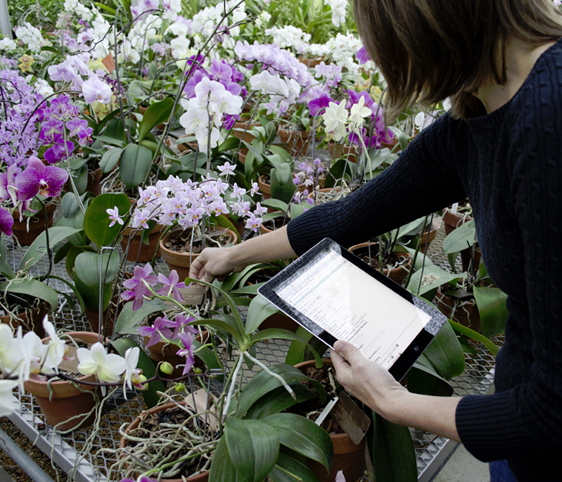 Plant Records at Missouri Botanical Garden are maintained in a custom web-based SQL database. This comprehensive Living Collections Management System (LCMS) is fully integrated with the Garden’s Tropicos database and our mapping data in ESRI’s ArcGIS software. Each plant in the living collection is labeled with an identification tag that is embossed with its accession number, botanical name, and collector name and number, if applicable. In addition to the embossed tags, many of the plants in the Garden have plant identification labels that provide common and scientific names, native ranges, and the botanical plant family to which the plant belongs. 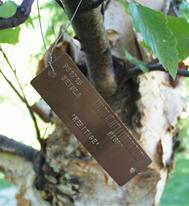 There are also many interpretive signs throughout the Garden to further educate visitors. To ensure the proper identification of plants in the living collection, voucher herbarium specimens are prepared. The identity of each voucher is carefully researched, and when validated, the voucher number and validator's name are entered into the database. If you are interested in donating plant material to the living collection, please complete the Plant Donation Form. For additional information, contact Rebecca Sucher, Living Collections Manager, at (314) 577-9407 or via email. 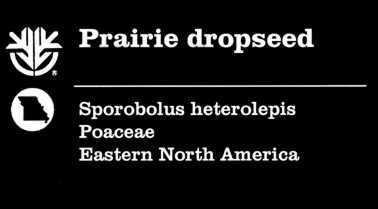 There are several other label formats in addition to the standard format shown above. These include 2" x 4" labels for close viewing, 4" x 6" tree labels, specialty garden labels, and combination labels to name a few. All of our labels are fabricated in-house using UV stable microsurfaced impact acrylic (2-ply, matte finish, 1/16" thick) and are engraved with a laser engraver. Labels are generated from data exported from our Living Collections Management System via reports in Microsoft Access. The Plant Records Department at the Missouri Botanical Garden maps many of the features in the Garden, including the paths, water features, buildings, planting beds, and of course, plants. This is accomplished through the use of Geographic Information Systems, or GIS, technology. The Plant Records Department uses GIS software products by ESRI (Environmental Systems Research Institute) to manage our geographic data. A high resolution orthophotograph (4-inch resolution) is used as the base of the GIS. ESRI's ArcMap software is used to build layers on top of this orthophoto. Features in the Garden such as paths, buildings, and water features are simply "drawn" on top of the orthophoto using and ArcMap's drawing tools.